Most of us were aware that Harold Camping predicted that the "rapture" would happen on Saturday, May 21, 2011 at 6 p.m. in each time zone. Camping had already (wrongly) predicted this event to happen in 1988, and again in 1994. Explaining the 1994 event-that-never-was, Gary Demar writes, "Through a series of intricate calculations based on a number of unproven assumptions, Camping concluded that Jesus would return sometime in the fall of 1994". When those dates came and went without the cataclysmic event happening, Harold Camping took his spot in a long line of failed "Last Days" prophets. So it's strange that he was back on the public scene making another "end of the world" prediction. And, again, this one didn't happen either. I wonder if there should be a "three strikes and you're out" policy for "end of the world" predictors. I doubt it because, as Matthew Paul Turner noted in a Washington Post opinion piece (dated May 16, 2011), "Chances are, May 21 will come and go like any other day. And when we wake up on May 22, the leaders of this Judgment Day movement will have a perfectly 'biblical' explanation why all of us aren't standing before God preparing to be judged". 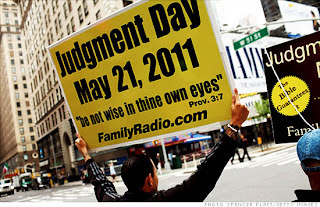 When May 21 did come and go, Campping did just as Turner and many others predicted he would: he said he was off by 5 months and that the Rapture AND Judgment Day will both occur on October 21, 2011. I want to say that I don't think Camping is being malicious, but I do think he's seriously mistaken. In fact, many people I know envision the same scenario that Camping does; the only difference is that he had the audacity to stick a date on it (again)! So I do find it somewhat laughable that people whose version of eschatology ("last things") is strikingly similar to Camping's, are chiding the elderly (89-year old) man for daring to declare what he believed to be the revealed truth of the Scriptures. The problem, therefore, is larger than simply elaborate timetables and predicting dates. The problem is the whole view of the world becoming more and more degenerate until Jesus finally snatches Christians off the planet so he can blow it up. The "last days" aren't sometime in the future; in the New Testament the "last days" refer to the whole time from the first coming of Christ until his return. That's why Peter can say, "God chose him [Jesus] as your ransom long before the world began, but he has now revealed him to you in these last days" (1 Peter 1:20 NLT, italics mine). Or again, that's why the writer of Hebrews can say, "And now in these final days, he [God] has spoken to us through his Son" (Hebrews 1:2a NLT, italics mine). 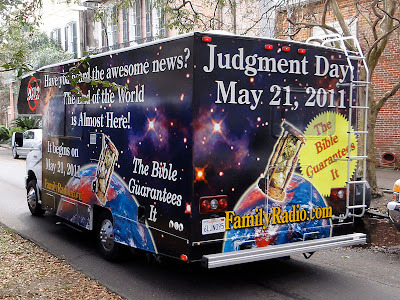 Harold Camping, along with Tim LaHaye, Hal Lindsey, John Hagee, and many others have filled the contemporary Christian imagination with fanciful theories about how the future is going to play out. And to make it all more believable, they even mention modern nations, weapons, and technology. But not to worry, they tell their followers, you'll be snatched away into heaven before all the "tribulations" start...you'll have a front row seat as God plays the role of a construction foreman overseeing a demolition! But contrary to this view and what some books and website say, the second coming of Jesus is not a time when Christians sprout wings and rocket engines to fly off into a non-physical, never never land. It is always the reverse of that scene: Jesus comes to earth, Jesus becomes present where his physical presence has been absent, Jesus appears where he has been hidden. These are the scenes that we are given in the New Testament, and they offer a drastically different vision than that of Harold Camping. * I also wrote about this issue last September (click here) when a guy I know was predicting the rapture would happen later that month. Gary Demar, Last Days Madness: Obsession of the Modern Church, 27. Matthew Paul Turner, "May 21, 2011: The Harm that 'Judgment Day' Will Do," May 16, 2011 (http://www.washingtonpost.com/blogs/guest-voices/post/may-21-2011-the-harm-that-judgment-day-will-do/2011/05/16/AFdYwp4G_blog.html) accessed 5/25/11.